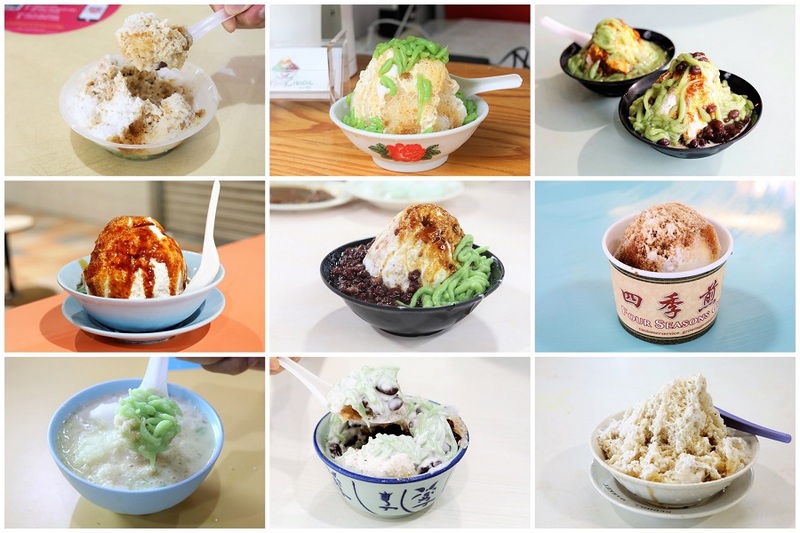 After CNN named “Cendol from Singapore” as one of the 50 world’s best desserts, there was an uproar on social media about the dessert’s origin. Let’s not dwell further on that. 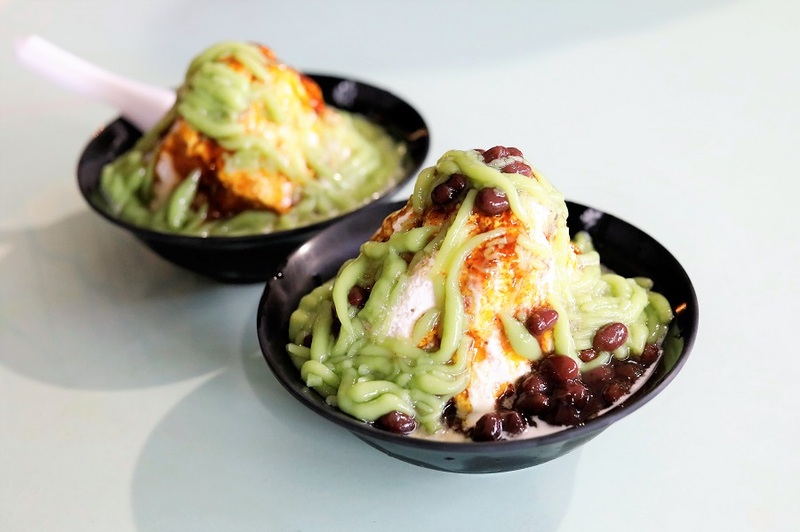 Cendol (or “Chendol”) is a sweet iced dessert known for its mixture of ingredients from the signature green rice flour jelly, to coconut milk and palm sugar (Gula Melaka). 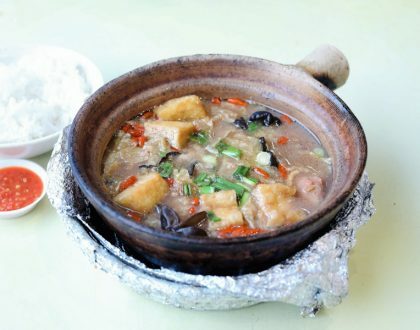 Some add in other ingredients such as red bean, sweet corn and attap chee. 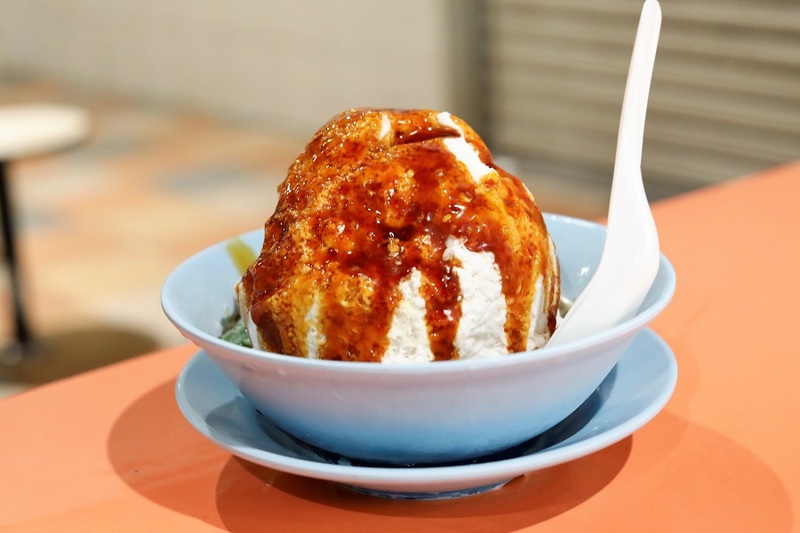 Most stalls in Singapore serve Chendol as part of their huge dessert repertoire; and some may choose to add in ingredients that lang-ga (clash) from glass jelly to agar agar cubes. One word – No. The stall is helmed by Calvin and Ewan, two friends who originally did not know anything about making desserts but proceeded to revive the stall when the original owner wanted to close it down. Prices of the desserts still remain about $1.50 and $2.00 on average. 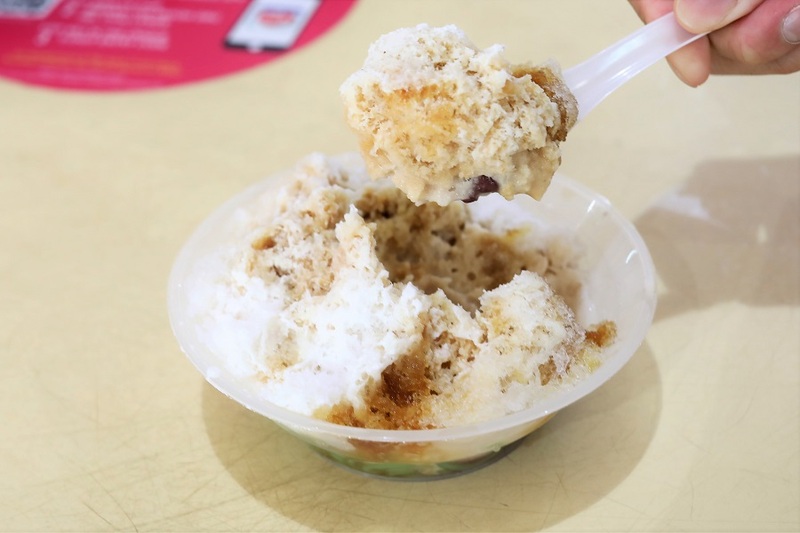 The stall received top votes at the Singapore Food Festival, and their fame lies in their delicious bowl of Power Chendol. Priced at $2, you get generous servings of ingredients, drizzled with thick Gula Melaka syrup imported from Indonesia and cooked daily by the stall owners. It is called ‘Power Chendol’ for a reason. The Gula Melaka was thick, flavourful and mildly sticky, almost like glue sticking on top of the mini-hill. The gooey and heavy palm sugar imparted an intense and rich flavor. The ice is rather compact, so may need some ‘knocking’ from the spoon to hit it apart and mix the syrup all in, which otherwise may be too sweet. Otherwise, very shiok. New branch at 724 Ang Mo Kio Ave 6. 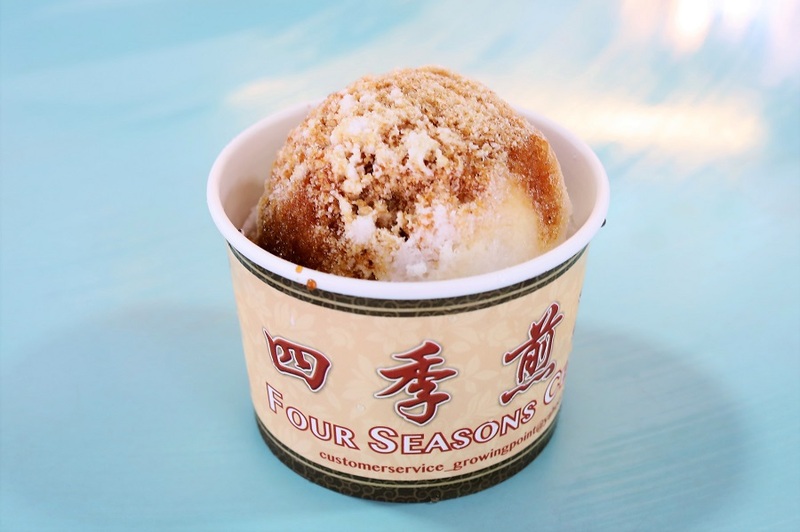 Four Seasons Cendol is commonly recognized by many to serve the best cendol in Singapore. Other than an outlet at Toa Payoh Lor 8, I just discovered a branch at Ang Mo Kio Ave 6 Food Centre. Keep your expectations high when you visit this place for a rich and creamy bowl of sugary delight. Every bowl is prepared on order and swiftly put together within a minute so you don’t have to wait too long. It is exceptionally tasty and the presentation is also Instagram worthy (shoot your photos fast in this hot weather though). I got myself a bowl of Cendol for $2.20. The bowls already have attap seeds and red beans, filled up with thick green jelly and ice shavings in a perfect dome of deliciousness. The stall opens till 12:30am by the way. Chendol for supper? No problem. Seems like the famous Cendol stalls are found at Toa Payoh. The Chendol at Dove Desserts is freshly prepared, with generous ingredients. I loved the springy and mildly fragrant jade green ‘worms’. While there is no one component that stand out, I thought that all ingredients balanced well, and complimented the Gula Melaka and creamy coconut milk. Ice was not too coarse as well. Note: Sometimes they are sold out way before closing hours. Run by young hawkers, I would say that Old Amoy Chendol is one of the best versions I had in Singapore, with rich and thick Gula Melaka. It used to be located at Chinatown Food Centre, and has moved to F&B12 Trengganu Street as the hawker centre is undergoing renovations. Get a delicious bowl of the famous cold dessert at only $2 for a bowl, and this stall with 4 seats is dedicated to just this one dessert. It was light with a lovely coconut taste, smoky and fragrant Gula Melaka to complement the soft and sweet red beans. The surprisingly element was the soft green jelly which had a distinct pandan fragrance. However, I tried it again recently and thought the ingredients weren’t as ‘full’ as before. The Coconut Club at Ann Siang Hill which received the Michelin Bib Gourmand, is actually famous not only for the Nasi Lemak, but Cendol as well. A bowl of Cendol ($3.80) at The Coconut Club is definitely more inclined towards the rich and creamy, with dense coconut milk that gives the bowl its most dominant flavor. If you want to enjoy it with red beans, you will have to pay $1.20 more. Would be happier if it was a bigger portion. Where did Nyonya Chendol come from? 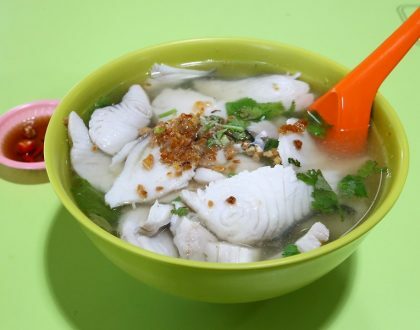 Out of the ‘sudden’, you see outlets popping all around the island with its distinctive white and green signboard, and menu of 4 Chendol items. 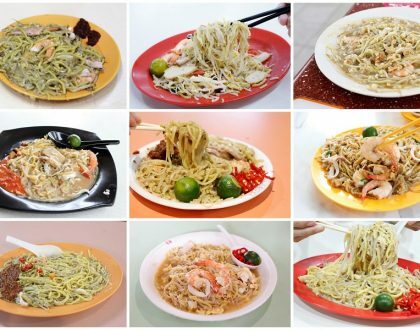 You can find the stalls at Bukit Timah Food Centre, Old Airport Road Food Centre (#01-115), Whampoa Food Centre (#01-17), Blk 85 Redhill Food Centre (#01-57), Albert Street Food Centre (#01-69), and Boon Lay Food Centre (#01-130). Nyonya Chendol specializes in the sweet icy and milky dessert of Chendol, serving the traditional, plain Chendol ($1.50), Red Beans Chendol ($2), Sweet Corn Chendol ($2) and XO Durian Chendol ($3). The first noticeable thing was the big mound of shaved ice, which suggested that they aren’t stingy with their ingredients. 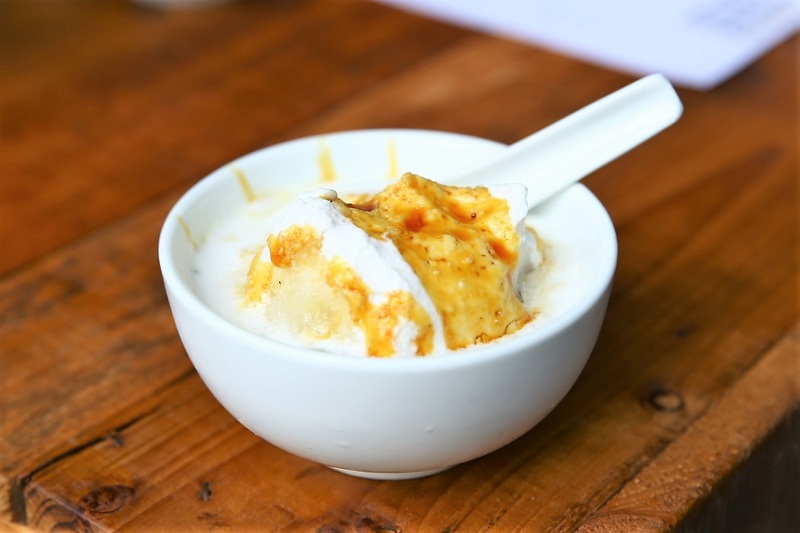 The ice was flavored with thick and glossy Gula Melaka and heavy coconut milk with a smooth and pleasing texture. The highlight of course, was the luscious red beans. While standards may not be consistent among the various branches and it may not be the best-best, the dessert is generally a crowd pleaser. When I asked for Cendol recommendations in Singapore, many actually commented Malaysia Boleh served up a cheap and good version. You can also find similar versions by concepts under the same group, such as Malaysia Chiak! and Tangs Market – the basement food court. 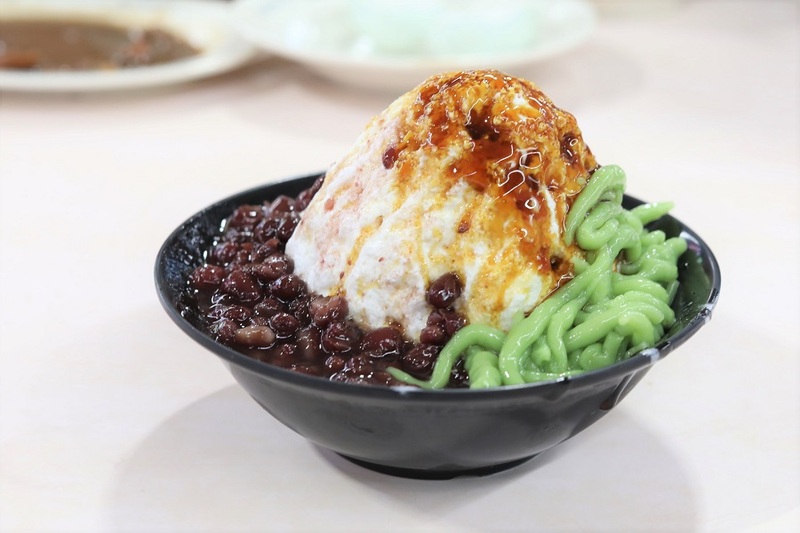 The Penang Road Chendol ($2) is prepared Teochew style and comes with green jelly that is prepared fresh with pandan leaves. While the red beans were plump and coconut milk creamy and heart, the serving size would be larger and ice less coarse. While uncle didn’t dance when I was there, he was still very jovial and ‘moving around’. This stall serves up quite a variety of both hot and cold desserts, from Chendol, Sea Coconut Iced Jelly, Ice Kachang, Cheng Tng, Red Bean Sauce to Mango Pudding Cocktail. The Chendol is very affordable at $1.50, with a Durian version at $2.50. While the dessert was not the most aesthetically pleasing – all the ingredients were buried below, the ice was soft, coconut milk fragrant, and red beans delicious. 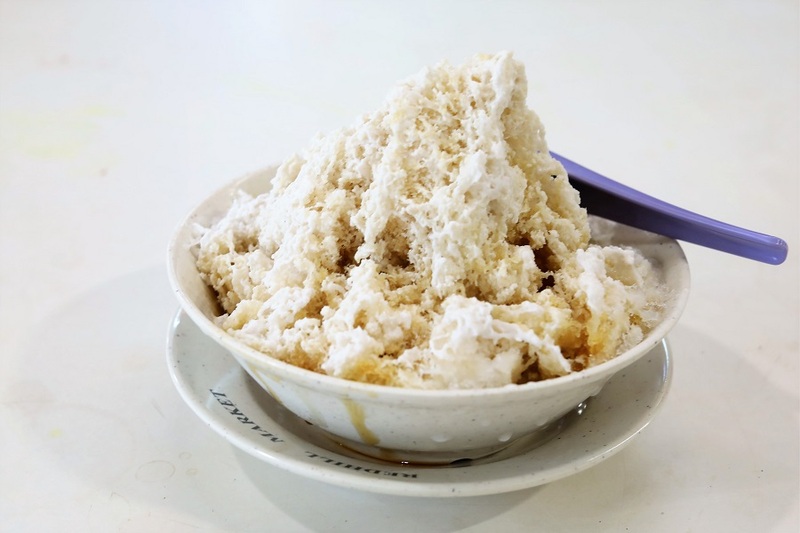 This 50 year old Geylang Serai stall serves up traditional Indonesian-style Cendol. This stall is one of a kind. They have been serving cendol for decades, tends to receive relatively long queues every single day. They serve up 3 versions – Cup with Ice ($3), Cup without Ice ($3.50) and Bowl ($2.00) for dine in only. One thing to note as well, they don’t include Red Beans in this rendition. The green pandal flavored jelly has more rice flour in it than any other place, making it soft and flavorful. The coconut milk and Gula Melaka tasted fresh as well, though overall was slightly on the sweet side. Some people may find it less value-for-its-money than others as it did not include other ingredients such as attap seeds, red bean or sweet corn. 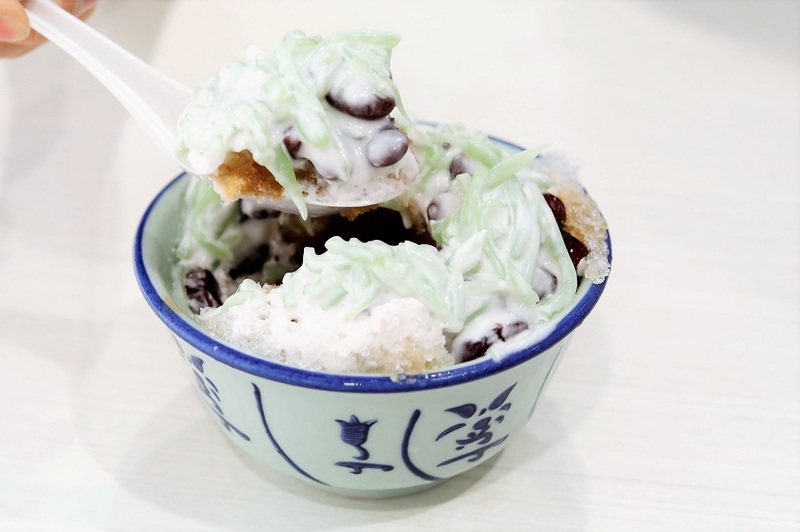 The bowl of icy Chendol ($2) is made from fresh and creamy coconut milk infused in shaved ice. 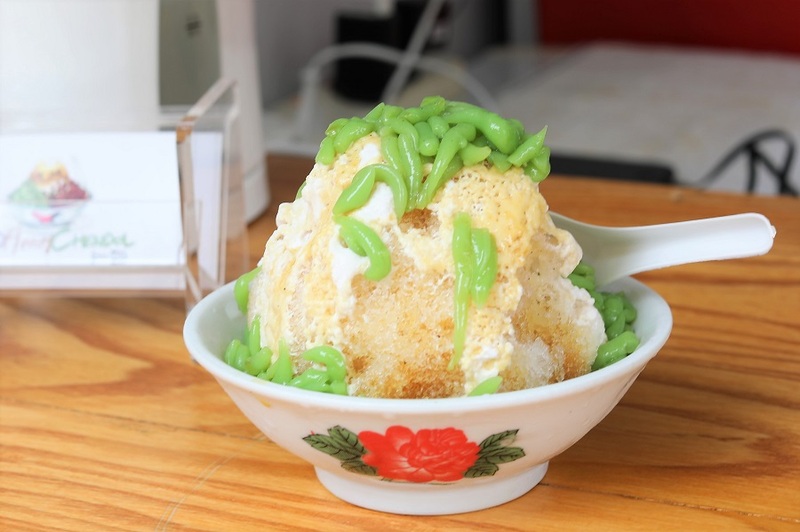 It is drizzled heartily with thick and sticky Gula Melaka, has soft and springy chendol strips and thick red beans. Woww so delicious. I wanna eat it now.